← Allant Trio Works Hard, Plays Hard! Did you know that our neighborhood is called Little Siberia by the locals? Yep, we’ve got “Russia Hill” by High Falls on Route 3 and the “Siberian Rod & Gun Club on Dannemora Mountain! Russian Duo offered one of their signature performances to about 100 rapt listeners. Native Siberian Balalaika artist Oleg Kruglyakov simply has this music in his blood, his being. His sense of timing and rubato, his overall musical gesture, is the real deal. His singing of Russian songs completely drew us into his world – at one point he had the audience clapping along unabashedly, deliriously. 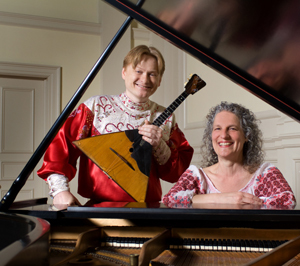 Formidable pianist Terry Boyarsky is a sensitive and worthy music partner, offering complete support and musical context, yet always allowing the balalaika to shine. What with the changeable weather, we had been concerned about the piano staying in tune, but Terry said not to worry – the balalaika is never in tune! Part of it’s charm.